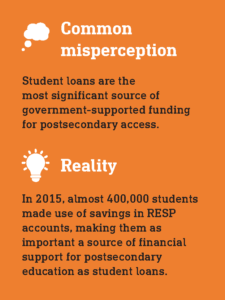 Research shows that education savings plans help children as young as four years old develop a postsecondary-bound identity. Students with education savings plans perform better at school, and are more likely to enroll in and complete postsecondary education. Over the course of a generation, this is an investment in the futures of low-income youth and in a less unequal society. A university graduate will earn a lifetime income of $800,000 more than a high school graduate. 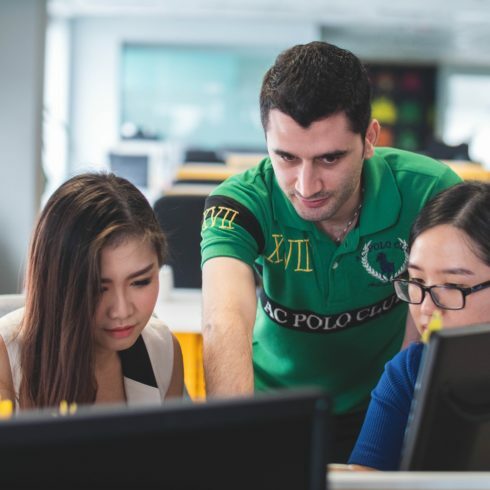 The federal government created a social and financial innovation called the Canada Learning Bond (CLB) in 2004 to provide low-income families with a substantial contribution and ongoing incentives to save for their children’s postsecondary education. The CLB program provides up to $2,000 per child over a 15-year period. All that eligible families or guardians have to do is open a Registered Education Savings Plan (RESP) account at a bank or credit union, and file tax returns. Four years after the creation of the CLB, only 16% of those entitled to it had registered for one. Promotion was weak, and awareness of the program was low among prospective beneficiaries. Instead of signing up in significant numbers for free government support, many well-intended low-income parents turned to the well marketed scholarship trust industry, whose products are generally expensive and inflexible. The CLB doesn’t require parents to pay anything. Omega addressed the CLB enrolment gap in several ways: challenging the scholarship trust industry to improve its practices; calling on banks and credit unions to put more effort into CLB promotion and staff training; organizing with community partners; and conducting ongoing advocacy and research. Today the national CLB participation rate is 37% — a big improvement, but well short of what it should be. In the northern Manitoba postal code of R0B —a vast area 750 kms north of Winnipeg, and mostly Indigenous — enrolment is only 1.5%. While it could be argued that such a program should simply be universal, the work of the Omega Foundation and its partners is focused on working with provincial governments to add the CLB to existing frameworks, including their online newborn registries. Ontario added this service in March 2018 with other provinces soon to follow. The foundation continues to engage government, the private secure and civil society organizations, fostering cross-sector, community-wide collaboration, in the belief that we all have a responsibility to provide equality of opportunity to young people. Omega is a Canadian public charitable foundation established in 1992 to help low-income people achieve financial self-sufficiency. 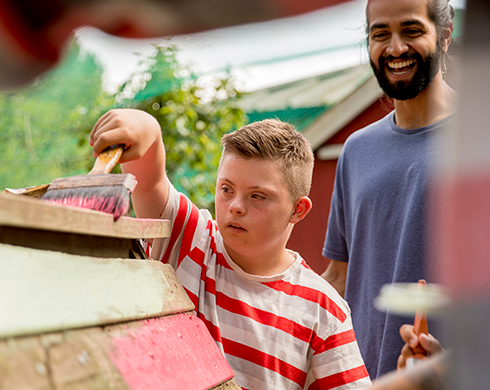 Omega created SmartSAVER, a community non-profit project aimed at making it easier to understand and access the RESP and Canada Learning Bond (CLB) programs. 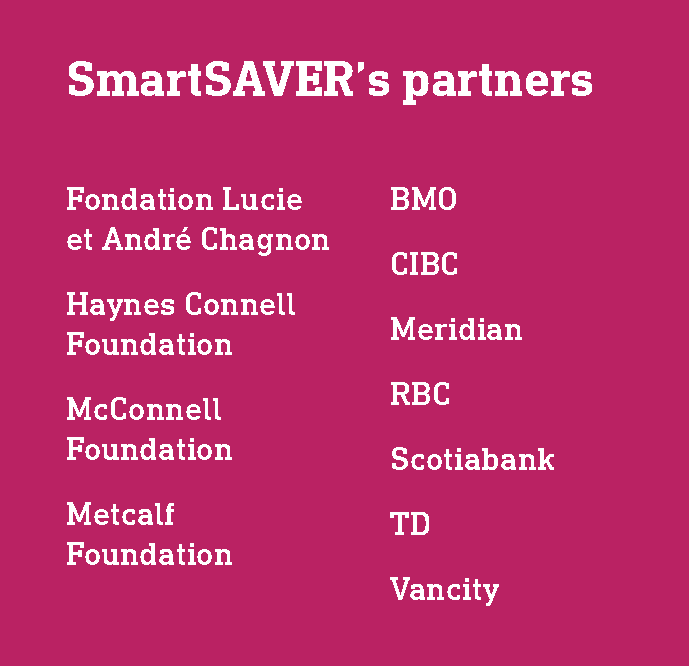 Since SmartSAVER was created, numerous foundations and financial institutions have come on board to boost the project’s reach and scope. 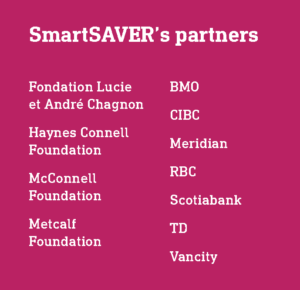 With increasing philanthropic support, SmartSAVER has scaled up its work with financial institutions to improve the sign-up process and to market the CLB more effectively. The network of community-based organizations promoting the CLB has grown from 19 in 2015 to over 70 in 2017. Outreach efforts of these organizations has had a significant impact in raising overall awareness of and interest in the CLB. Google searches for Canada Learning Bond increased 86% between 2010 and 2017. To date, over 15,000 applications have come through the SmartSAVER online application. 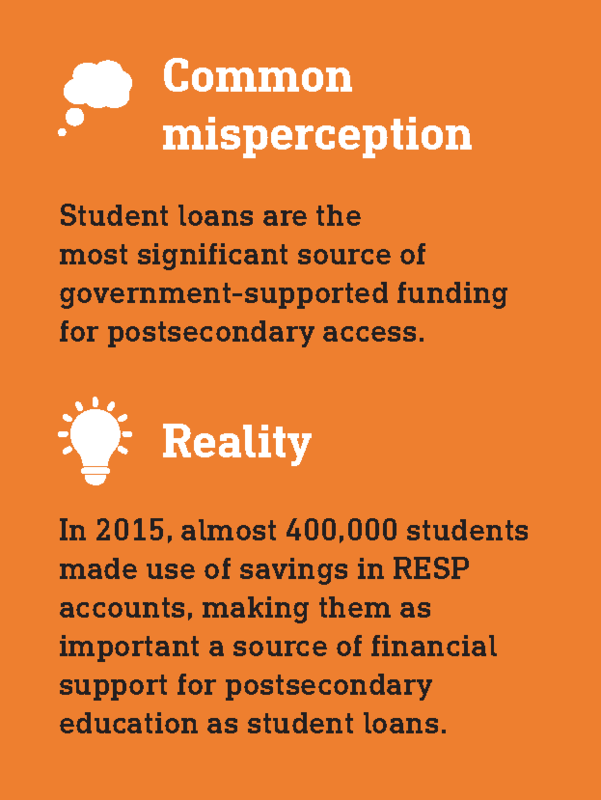 In 2016, ESDC released a study of the post-secondary savings behaviours of low-income families. The study found that even though a family contribution is not required, 97% of CLB-enrolled families make an additional contribution, averaging over $1,000 annually. This suggests that given an opportunity to save for their children’s postsecondary education, low-income families will make considerable sacrifices to do so. To accelerate take-up, banks need to commit additional resources to promoting the Canada Learning Bond (CLB). Canadian banks are among the most profitable in the world and could be doing more to help families through the process of signing up, which would in turn help address growing inequality gap between rich and poor families. First Nations, Métis and Inuit communities should be supported in promoting the CLB in a culturally appropriate manner. The federal government should be congratulated for restoring the CLB promotion fund. But with over 1.5 million children entitled to and not receiving the CLB, more aggressive action is needed if we are to raise a generation of children for whom cost is not a barrier to post-secondary education. 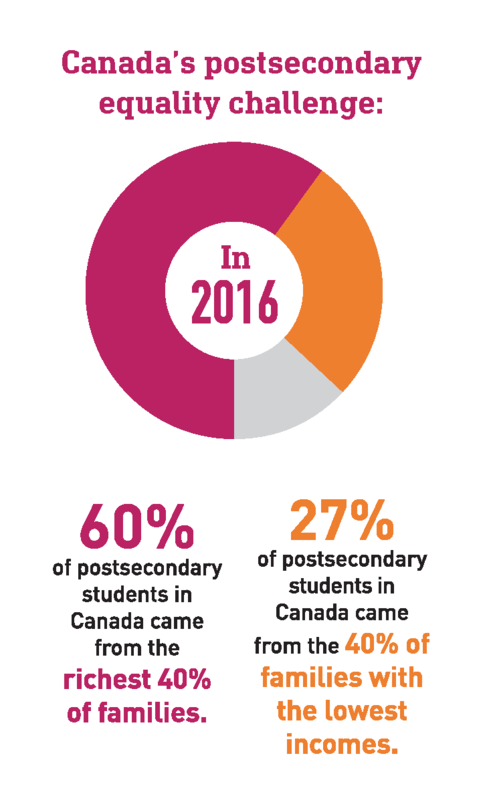 With deeper collaboration among all sectors — on the CLB and complementary programs to improve postsecondary access — Canada can deliver educational opportunities for the many, not just the few. 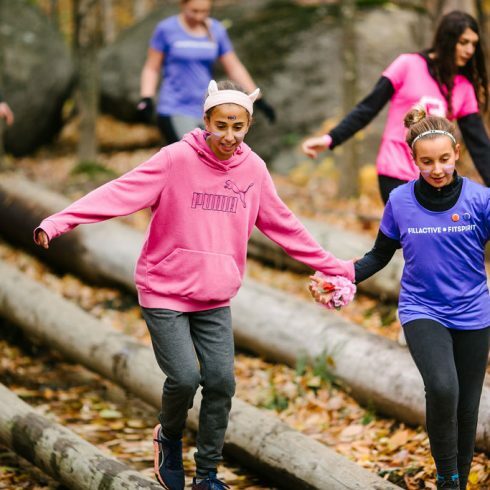 The McConnell Foundation supported the Omega Foundation with a grant of $500K through the Social Innovation Fund and subsequent grants of $145K for ongoing work to scale up their work on the CLB.